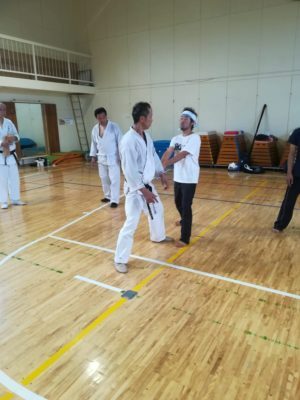 Report of the Aunkai Open Seminar, given by Minoru Akuzawa sensei, successfully held on 2018-09-17. 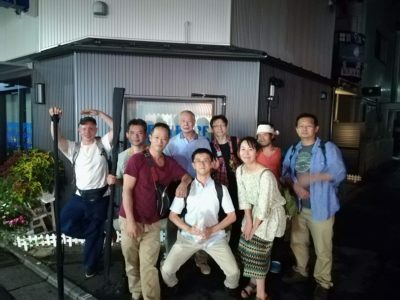 Participants came from as far away as Nagano. And despite being autumn, the day was hot as summer, resulting in frequent water breaks. Sensei concentrated on teaching the essentials of “relaxing” (in Japanese, “Chikara wo nuku”). While some strength is needed, essentially, when changing posture and form, the parts used vary. 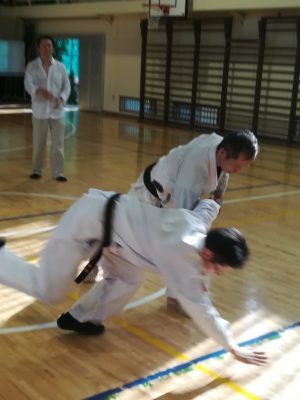 As a teaching tool, one method of learning this with the elbow was introduced. In this drill, the elbow is lifted while the partner is hanging vertically at the end of the wrist. 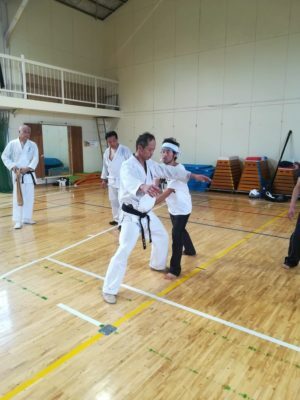 The way of using the whole body from the feet and hips across the back and shoulders to lift the elbow is then the same as that use to strike with the fist, as sensei then demonstrated against pads—with the perceived weight the penetrative power of the strike a great surprise to the recipient! One interpretation of “relaxing” in this particular case is to not use strength to interfere with the operation of the intended parts. However, just relaxing loosely is also useless; the correct posture to facilitate relaxation is necessary. 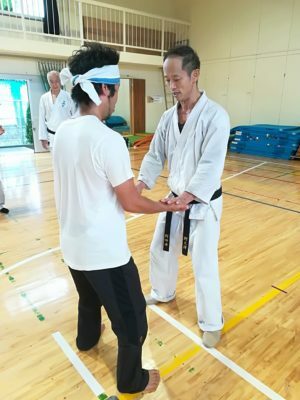 The next step was accepting and returning a pushing force against the hips from the front, and later from the side, but accepting and then returning to the original position by the release of the tension built up by accepting. This was a great drill to learn the natural position, and accepting movement, required for the hips to work efficiently. Building on the previous drills, sensei then had us go through a drill where the partner would push on the hands semi-freely, and the practitioner would try to accept and return the force without putting strength into the elbows. 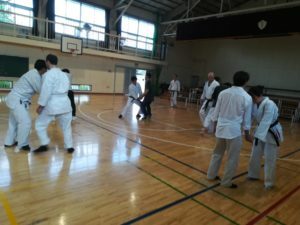 The seminar provided a good change to touch people outside of the Aunkai training group. Each partner’s individuality in performing drills was a chance to re-calibrate one’s own understanding of one’s body, and different errors came to light for correct. 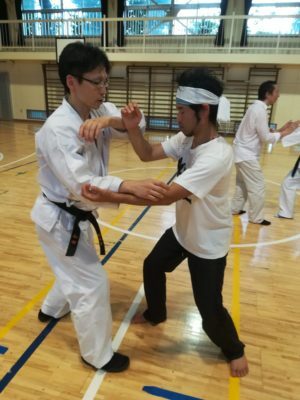 It was brought home once more how despite the overt power evident in sensei’s movements, the core of the power comes from a detailed understanding and use of posture. 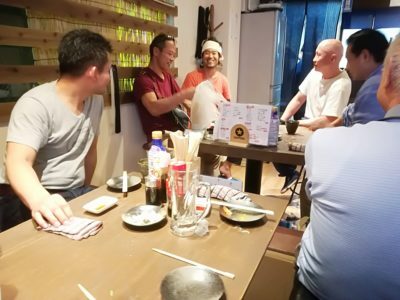 After the seminar a gathering for dinner was held close by, a happy conclusion to the hard work. 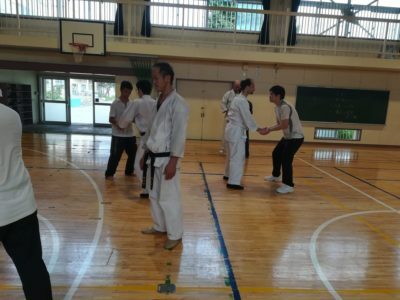 We are very grateful to all the participants, and to sensei for his valuable teaching.